Rosslyn Chapel in Scotland has the legend that the Holy Grail lies within the Apprentice Pillar. The legend of the death of the Apprentice killed by his Master Mason has the ring of the Hiram Abiff story of the Freemasons. Rosslyn chapel is a tribute to masons. The carvings of stone fill the whole chapel from top to bottom. Another legend talks about the Saint Clair family being the protectors of the Holy Grail which was brought back from Holy Land during the Crusades. Winged dragons lie at the bottom of the Apprentice Pillar as well as a serpentine vine winds around the pillar. If the Holy Grail represents the holy bloodline of the Holy Family then the serpentine vine structure reminds us of the twisting of the DNA molecule. The DNA Molecule is the tree of life and the molecule of creation. "I have blessed you by YHVH of Samaria and His Asherah." Asherah was calld the Queen of Heaven. Asherah poles or pillars were made in her honor. At the Migdal Synagogue was found a stone with two tree like pillars with a serpentine vine wrapping around them. It dates back to the time of Christ. Asherah poles are mentioned in the books of Exodus, Deuteronomy, Judges, the Books of Kings, the second Book of Chronicles, and the books of Isaiah, Jeremiah, and Micah. The Apprentice Pillar resides in the Lady's Chapel. It may represent an Asherah pillar. Asherah poles or stones were placed in groves of trees. She was connected to the Tree of Life. 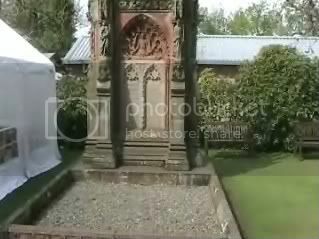 Rosslyn chapel is a garden of stone. All around the chapel are flowers and vines carved out of stone. A forest of trees surround Rosslyn Chapel. Egyptians used pillars for their temples at the entrances. The Masons such as the legendary Hiram Abiff and the Temple of Solomon masons built the great pillars called Boaz and Joachim (1 Kings7:21). Freemasons use the symbols of the two pillars Boaz and Joachim. Solomon's Temple was a marriage of male and female energies merged together. The Freemasons has goddess imagery such as the Statue of Liberty who was financed and built by Freemasons. The Asherah pole was an upright pole draped with a embroidered cloth. The square and compass of the Freemasons is the merging of male and female energies. The Hunterian Psaltar was said to be produced in 1170 in England. It was a time of the Crusades and the illuminations bring some interesting evidence of what the nobles and monks religious beliefs. In the Psaltar it seems a merging of pagan symbolism and Catholic imagery. The winged serpent appears mutiple times in the psaltar. Hit the link and you will see what appears Christ on a tree with a strangled winged serpent wrapped around his feet. Hit the link below and you will see Mother Mary standing on the head of the winged serpent who is humbled but alive. Hit the link below It is an example of the winged serpent wrapping itself around the pictures and words of the psaltar. The winged dragon held a different place in the imagery verses the devil. In the Psalter the devil is portrayed differently. The serpent wraps around the Tree of Knowledge very much like the Apprentice Pillar vine. The serpent only has eyes for Eve. Eve ate of the Tree of Knowledge first before Adam. The winged serpent and serpent imagery was imagery of wisdom and healing. The Druids had a caduceus of two serpents merged together. I did notice on the Arms of James FrancisEarl of Rosslyn in Patrick Pollen's stained glass window in the Crypt has two winged dragons one dark and the other light. The winged serpent's imagery is interconnected with the goddess such as Diana, Asherah, and even Mother Mary whose foot stands on the serpents head. The Pillars of the Temple of Solomon were said to be hollow and contain the records and hidden information for protection. A interesting picture in the Hunterian Psaltar is the Raising of Lazarus. Hit the link below and you will see the picture of Jesus raising Lazarus who was Mary of Bethany and Martha's brother. Hit the link and you will see the lower frame of Jesus pulling the hand of the mummy Lazarus. In the above frame you will see the devil who has no resemblance to the winged serpent. A close up shows that Jesus has no eyes for Lazarus but that his eyes are only for the beautiful Mary of Bethany who has eyes for only Jesus. Did the Crusaders have knowledge of Jesus's great love for Mary of Bethany? In this Psalter dating back to 1170, it appears they may have known of the love connection between Jesus and Mary. It is possible that the legend of Joseph of Arimathea coming to England perhaps he brought this tale of love or is it due to secret knowledge brought back from the Crusades placed in the Psalters and Bibles of the noble families who commissioned them from the monks. The Celtic monks may have known of the knowledge and placed it in the Psalter. Hit the link of a close up of Jesus and Mary of Bethany looking at each other during the raising of Lazarus. Mary is the only one there who believed Jesus could raise Lazarus. "Wine is strong, a king is stronger, women are stronger still, but truth conquers all" (1 Esdras, chapters 3 & 4). Is the Apprentice Pillar about the Holy Grail which is the search for Truth? What do you think?